All Custom Aluminum makes planning your new project simple and easy. Unlike working with General Contractors, which involves a time consuming and costly process, working with us is a breeze. Because our estimating and design is done by the owners of the company, you get service that is a cut above. The process begins when we arrive on site. While most common wood frame construction involves a reworking of any existing foundation, the vast majority of our projects are engineered to work with existing foundations. This factor can be very cost effective, as the cost of removing and adding concrete footings and foundations can be a large percentage of the overall cost of construction. Because our materials are strong but lightweight, we can avoid much of the costly reworking of foundations, saving you time and money. 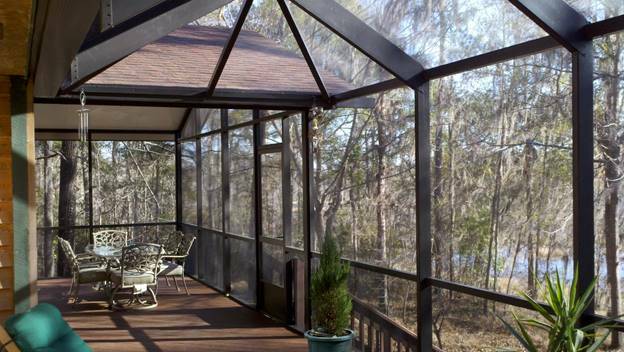 If you have an existing deck and would like to add a screen room, our products are designed to be constructed on it with little modification, while wood framed structures typically require starting over. Being able to utilize or add to your existing deck means you have more of your budget to devote to the finished product. If you need foundation work because you have no existing slab or deck, All Custom Aluminum can provide it for you as part of our proposal. We can even do masonry walls, footings, slabs, decks, and more from scratch, eliminating the hassles of coordinating multiple trades yourself. Since we work primarily with aluminum products, we avoid many of the pitfalls of working with wood. Aluminum has many superior engineering characteristics, not the least of which are its lighter weight and greater spans. And working with aluminum also typically takes a fraction of the time as undertaking projects the old fashion way. 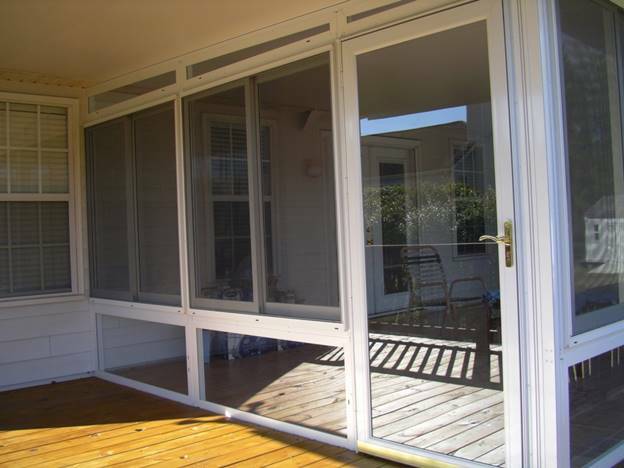 All Custom Aluminum fashions our enclosures from a high quality alloy of aluminum which has an electrostatically applied powder coated finish which lasts much longer than paint without all the periodic maintenance of wood framed construction. When it comes to solid roof products, All Custom Aluminum also brings options to the table which are designed to save you time and money and provide more for your budget. affords an appealing aesthetic look with an insulated, extremely dense core and a reflective energy efficient upper layer. Together, these elements create a walkable, high strength roof system which is appealing and cost effective to install. 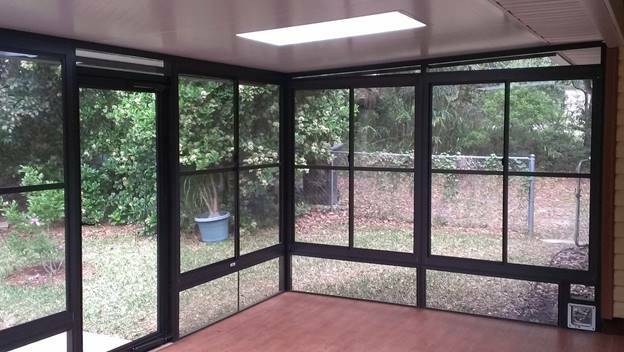 While our screened enclosures utilize a high quality screen which is thicker and more durable than window screen, we also have many other options for creating protected space. 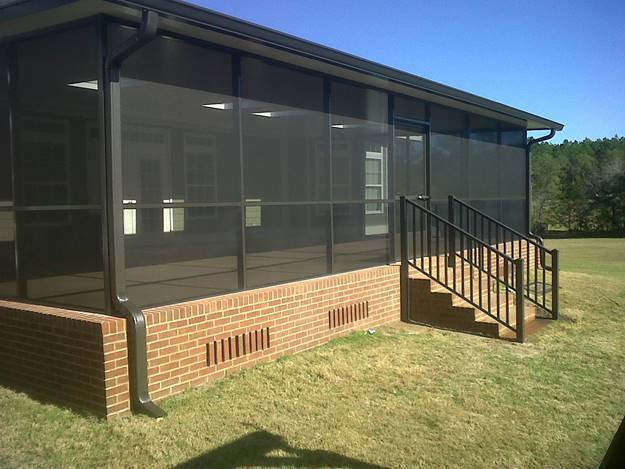 All Custom Aluminum can install insulated glass windows and panels in many configurations, from movable windows to fixed glass panels which, together with our extruded aluminum framework, create spaces in which the glass element is featured with a minimum amount of interference from large, bulky posts and cross members. Need a three or four season space, but leery of going with full glass? We offer a complete line of flexible yet durable vinyl pane patio windows, which can be installed almost anywhere and afford insulation and protection from the elements with the flexibility of being able to be removed at will to provide full ventilation. Adding outdoor living type spaces is fundamentally different than other types of construction. The reason is that typically, outdoor decks and slabs are not conceived as part of a larger plan to add enclosed space. Consequently, issues which would normally be resolved in the planning stages of construction are not addressed and the project must adapt to the circumstances. For instance, a deck may be installed beneath a bay window, uneven or multiple fascia heights, may be out of square, curved or otherwise situated in a way which makes building on it difficult or impossible for traditional construction techniques. At All Custom, we realize that no one designs their pool around an enclosure which may be added, no one places a slab thinking about the potential screen or glass room which may be added years later. they have been told that by more traditional Contractors. When we have an opportunity to evaluate their situation, it is often the case that what the homeowner thought was a problem wasn’t. It all boils down to the flexibility of our products and creativity of our designs. For those who do not have a foundation in place, there are a few rules of thumb which can help to create a more synergistic addition. First, evaluate the houseline where you intend to enclose. Is it comprised of straight lines? Are there interruptions in the heights of attachment points? Could the project be modified slightly to avoid areas where attachment to the home could create problems? For instance, stoops and bay windows can complicate adding enclosed space because they interrupt the orderliness of the interface between house and enclosure. considering the feel of the space. 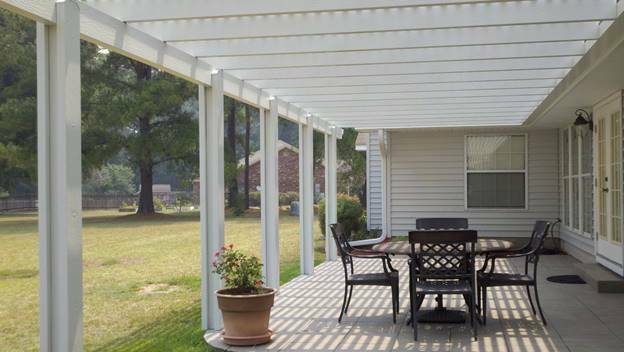 So adding a deck at the level of the house floor may seem more convenient in some ways, but if it compromises the interior volume of a potential enclosure, it may be that a step down is preferable. Finally, be willing to consider many options with regard to the use and enjoyment of the space. Many of our customers come to us thinking they want to enclose with a screened roof, or a solid roof, when the space may well lend itself to a hybrid design which incorporates multiple uses in one space. By exploring the many options, it is possible to adapt your design to reflect your intended use and the circumstances of the site. All Custom Aluminum provides consultation, estimation, and design free of charge. Typically, we will come to you, evaluate your situation, provide you with a host of options, and present a written proposal itemizing the services we would provide and give you a cost which is all inclusive. This process can take a few minutes, or a couple hours, depending upon the complexity and scope of the project and how many questions you may have. In most cases, getting on our schedule doesn’t cost a penny, and a signed proposal is all it takes to get the ball rolling. Our structures generally require wind load analysis and engineering, because even though our enclosures are aluminum, glass, and screen they must be constructed to the same standard as the home, sometimes even stronger. The design, engineering, and permitting phase of the project take place prior to construction at no cost to our customers. When we have all the groundwork completed, materials can be brought in and the construction phase can begin. It is typically at this point, when we show up with materials and start work, that we begin the draws or progress payments. We endeavor to structure the payments in a way that keeps the leverage in the hands of the customer, because we want you to feel comfortable with the process. The final payments are upon completion, but our responsibility to our customers goes far beyond that. treated, and appreciated as well as being happy with their job. Because a majority of our work is word-of-mouth related, we take this part of our responsibility seriously. 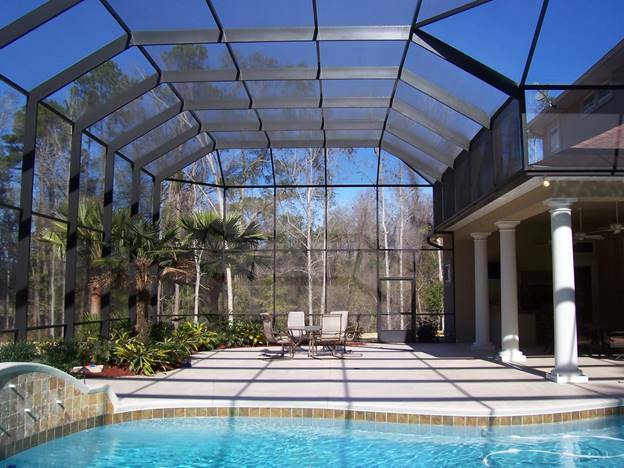 Over the years, we have literally constructed thousands of enclosures and created thousands of satisfied customers. From the top down, we at All Custom Aluminum understand that going the extra mile is part and parcel to the success of our business, and we invite you to call us and see the difference for yourself. Copyright © 2016 All Custom Aluminum. All rights reserved.